I watch Fellini’s Le notti di Cabiria and I’m transfixed. Before, I’d watched this film and La strada on TV when I was about four years old, and never again since. To date, these two films are my earliest memories of sadness, from an age when I could not have possibly ever experienced that type of sadness. Except through those films. I was always afraid of going back to them. So here we are, that sadness and I, thirty-odd years later. I find: a film of unstable balance between a profound sense of drift and emptiness (the bleak suburban Roman landscape, caves, open spaces, the main character truly lonely in every sense, no respite ever) and a lightness of touch, graceful interferences of unexpected gestures that place what is implausible in what is stark real. Rituals and representations exceed a self that is void, but not meaningless. At one point, Cabiria joins a pilgrimage to the Sanctuary of Divine Love and asks for grace. One of the women in the crowd shouts at the top of her voice, speaking to the Virgin Mary: ‘I am REALLY asking you. I am REALLY asking you’. As if screaming was the space where belief is validated. Cabiria cannot quite scream and barely sings, she is hushed and overwhelmed by the chanting and the demonstrations, the gestures, yet she is the only one who believes (maybe because she’s speaking to herself, not to any divine presence). In the next scene they all sit on a lawn having a picnic, life goes on untouched by the empty yet repeated ritual, except for Cabiria, who is deeply affected by the fact that, after the pilgrimage, ‘nun semo cambiate’ (in Roman dialect, ‘we haven’t changed’). At the end, the space of utter truth is revealed to be the space of utter deception; unlike later films by Fellini, here truth and deception exist osmotically, they do not outnumber each other by means of cartoonish exaggerations. The edge is softer and I am more easily driven in the film, not as a spectator but enmeshed, affected. Tags: archives, caves, lament, memory, song, who am I? or, the double book, or, the ambiguous nature of writing. Tags: archives, fabulation, Herman Melville, reading, who am I? One of the very hidden inspirations for my book title, En abîme, came from a couple of sentences I found in L’Afrique Fantôme by Michel Leiris – a book that’s been haunting me since the nineties, when I saw it mentioned in James Clifford’s The Predicament of Culture as a book where Leiris ‘begins to keep field notes on himself, or more precisely on an uncertain existence’. I return to Leiris’ book in spite of my poor knowledge of French, that only allows me to glimpse these pages and not always entirely grasp them. They speak to me in fragments across an opaque screen of understanding, lit up by sudden flashes of clarity. Sybilline, you might say. And so it is no coincidence that a photo of the Sybil’s cave in Cumae, near Naples, appears on my book cover. For further understanding I have to (I like to) trust Clifford. In particular his remarks on Leiris’ writing resonate with what I tried to achieve in my book: ‘…a systematically clumsy and complicated staging of the text for which the various elaborate explanations, supplementary notes, hidden prefaces, and prières d’inserer are props’. There is Pierre in En abîme, and sacred places, and subterranean caves. Poetry holds a notebook and a quill. She is just about to write something, but glances backwards, toward me, with brooding eyes. Is that page the space of knowing that some truth somewhere exists? Have I just caught her writing? Is poetry that space caught between my guessing and her glance? Is poetry that woman’s face? Philosophy is also troubled, his face so dark. He does not write though, his words have been written already – carved, it seems: ‘Aut tace Aut loquere meliora silentio’. ‘Keep silent unless what you are going to say is more important than silence’. Is philosophy this constant oscillation between an absolute silence, and the tension to say something so heavy that is heavier and more loaded than silence? As it were, the real titles of these paintings are not Poetry and Philosophy, but Lucrezia as Poetry and Self-Portrait as Philosophy. 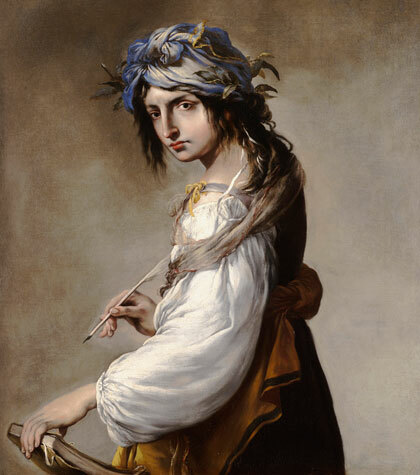 The Italian 17th-century painter Salvator Rosa, author of both paintings, used a portrait of his lover alongside his self-portrait to give shape to his allegorical representations of Poetry and Philosophy. As if the two could not be without a relationship, a tension in between. 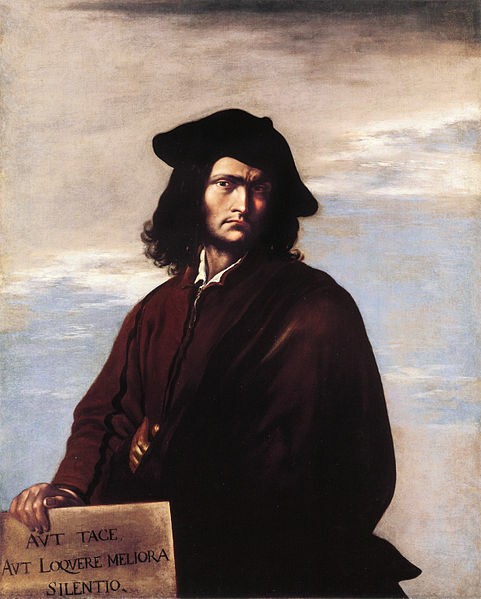 It is not ‘poetry’ and ‘philosophy’ as absolute categories that he seems most concerned with, but poetry in the face of Lucrezia, philosophy in the shape of Salvator. Unique human beings, lovers; their glances and their gestures, engaging in a silent dialogue, outlining a changeable territory of seduction, and breakups, and attractions. Looking for singular faces and catching the singular expressions of my Lucrezia Poetry and of my Salvator Philosophy, I imagine the possible words between them, or between me and each of them. I think of their singular expressions, one by one, I lose myself in a word, or in an inflection of the eye, rather than looking for any universal meaning or lines of demarcation beyond them. I am thrilled when I realise that a certain black in Salvator’s eyes is the same hue as Lucrezia’s. Or that they might share the sky above. Or that he is stuck in the immobility of his frontal posture, while she is all torsion and enclosed dynamism. And with the excuse of being Italian, I would move to one of my favourite writers with no further justification: Dante Alighieri. In the Letter to Can Grande della Scala, he writes of the Divine Comedy: ‘The subject of the whole work, then, taken literally, is the state of souls after death, understood in a simple sense; for the movement of the whole work turns upon this and about this’. For the movement of the whole work turns upon this and about this: the literal side, understood in a simple sense. What is remarkable is the emphasis on the literal truth as a foundation for any other levels of meaning. So perhaps I should look at these two paintings again in detail, and not think of Poetry and Philosophy at all, but of the faces and the bodies of Lucrezia and Salvator: literally. They seem to be inscribed in the same shade of grey, although more or less abstract in form. What happens when a poem is inscribed within a philosophical text? When thought flows into poetry? I go back to another book by Dante. The Convivio is a treatise dedicated to Lady Philosophy; it is a book on knowledge, and it is full of poems. Furthermore, it is written in volgare, not in Latin: in 14thcentury Italy, Latin was the language of philosophy and vulgar was the language of the people, of songs, of poems. Philosophy is impersonated as a woman Dante loves; the proximity between philosophy and poetry is resolved by intersecting the argument in the text with a number of poems, and through a metaphor in which knowledge is a banquet, and the food is poetry, and the bread that goes with it is philosophy. She calls proud and disdainful. and of itself is never clouded. Sometimes say a star is dark. But only as what she seems to her. Seems proud, when she casts her gaze on me. I will speak of you in every place’. ella la chiama fera e disdegnosa. chiaman la stella talor tenebrosa. quantunqu’io veggio là ‘v’ella mi senta. io parlerò di voi in ciascun lato’. ‘I will speak of you in every place’: could I think of the space opening up between philosophy and poetry as the space of speech? An utterance that is not necessarily delivered to destination, but that resounds nonetheless, and forms a space, makes the form of its understanding? Now I think of Pier Paolo Pasolini in the Protestant Cemetery in Rome, near the tombs of Antonio Gramsci and Percy Bysshe Shelley, before he wrote his poem The Ashes of Gramsci. Published in 1952, the poem breathed an elegiac and sensuous feel into the tight structure of a Dantesque terza rima. In these verses, Pasolini appears constantly torn between the moving force of thinking as a changing form and the pressing call of his aesthetic inclinations as the making of a shape. Like Pasolini sitting in the Protestant cemetery and speaking out the words of Gramsci and the words of Shelley through his own verses, wondering how the words of the two could breathe and exist in the same ancient rhythm, what is spoken out appears as a space of osmotic exchange that brings poetry and philosophy together and makes them alive: resounding. On 5 April 2011 I recorded an excerpt from my book for the Phonographies archive of wax cylinder recordings, curated by Aleks Kolkowski. The chapter takes place along via Appia and the Catacombs in Rome. Most of the book is structured on layers and returns, and the idea of superimposing two voices on the same wax cylinder seemed appropriate to reflect the phasing and unsteady unisons that occur throughout the book. Ghosts on via Appia this morning. Twenty degrees, rain and damp. Catacombs of Saint Callixtus, the archives of the primitive Church. Ninety acres of land, four levels of subterranean galleries twelve miles long. Half a million tombs. Cemetery of Saint Callixtus, Crypt of Lucina, Cemetery of Saint Soter, Cemetery of Saint Mark, Marcellianus and Damasus, Cemetery of Balbina. Tomb of Cecilia Metella. And when the sun falls down the pine trees I still walk on these stones and there is a humming coming from below the catacombs and these slabs of history. It whispers death along this evening, it breathes in, it breathes out, in, and out, following me chasing me out of this still city of tombs. I keep listening. This still dead city of tombs is chasing me, I walk. Up to this very moment walking, listening, recalling. I return to via Appia and to those Roman aqueduct arches, and to the mellow suburban countryside on a hot, rainy morning, November 2010. Once it was August, the year 1995, the heat unbearable, the black silhouette of the Cecilia Metella Mausoleum and the maritime pines drawing a silent backdrop to the early evening walk, that you and I had decided to take. We’d spent the whole midsummer day driving around the ring road of Rome, in one direction and backwards, filming – an exorcism against the boredom of that Roman summer and against that whole year, as a double noose holding and hanging that whole year. We’d spent the whole mid-summer day driving around the ring road of Rome, in one direction and backwards, listening – in the extreme sunshine and in the lethargic pace of Roman summers, car windows open wide and music full blast, until the texture of those sounds reached and merged with the melting lights. I return to via Appia and think of August. Signposts to depots circle like coils on this evening. Your Fiat Punto exhales hundreds of miles. We are going to circle, and circle. You scream, these coils are closing in. You’ve gone crazy in your rotten daydreaming. You’ve gone crazy for your rotten dreaming, that is to say: it hurts. We circle, enwrapped in this spiral of heat. It arrives as a piercing signal, a ruthless clasp of frequencies pointing right at the essence of rhythm. It arrives as the sound of a new disquieting language; as a rhythmic pattern and oscillation devoid of any reference, other that the push-pull of sound you feel in your body, and the grip of our sonorous now. A bony creature is dancing along the broken structures of audio tracks, built upon the sonic detritus of what once was called techno. Stark on a sensorial plateaux, a thousand needles pierce this sonorous now. Subtle, severe, insidious: here is a plus, here is a minus. A plus, a minus, a minus. Then come the bass sounds, to the earth and up from the earth. Don’t tell me these sounds are cold. If something resounds here, it is a shivering body: the body of rhythm exposed in its nerves, in the contractions that keep it alive. It might be mutilated by the cuts of this sonic blade but it is always there, in its presence and denial: a plus, a minus. I return to via Appia, with you and it is evening. In you Fiat Punto we are listening to Metri by Ø, aka Mika Vainio, I think I wrote about this record sometime. Then we park and we walk along the stone-paved street from twilight into night, listening to noises sifted from the sheltered villas. A knot of voices, smells, slivers of light. All the buildings, pines and stones narrated by the daylight have crumbled down into a storyless black. Across the metal bars of gates and the tall brick walls the night is here again. A low hum propagates, made of the same substance of the heat. Our blinded eyes and our deafened ears hope to see a new vision and chase a new melody. I follow the train of my thoughts once more, and the visions of those trains along the tracks down South, to a small town where one of us was born, it has one of the few preserved mythraeums in Italy. I returned to via Appia this morning, and I was lonely. Arthur Conan Doyle set one of his Tales of Terror just around here, The New Catacomb. The great Aqueduct of old Rome lay like a monstrous caterpillar across the moonlit landscape, he wrote. This evening the great aqueduct of old Rome in the moonlight doesn’t look much like a monster, but as a tamed force. I think again of your tamed silences, the long glances, and your restless longing for a space you will never allow anyone to circumscribe. I’m not sure if it is afternoon or early evening, but I know it was night when you first told me of this sense of waiting and longing. You are the imminence of a storm of ice, you smell of hunt and blood. You dark eyes, every day you lose some glow and gain some shade. Out of pure will you commanded your heart to be irregular as nothing ever in your life is regular: not the friends, not the hours, not your lovers or the lives you go through. Everything in your space deformed. Now a summer breeze moves through those pine trees, smells of sea salt and resin and cooking and smoke. Tomorrow it’s another go, another lap. You crawl. I walk back, alone and toward home. I enter the Basilica dei Santi Quattro Coronati and listen to the enclosed nuns as they sing the Vespers. Even the stones are drenched in the void of this confinement. Spargens sonum, what is this voice whispering muddled tunes into my ears? This morning I returned to via Appia, and to those Roman aqueduct arches and the mellow suburban countryside, following the steps of Rainer Maria Rilke, Nathaniel Hawthorne, Herman Melville. I was on their traces along the old Roman road, and as I walked I engaged with all of them in a series of fictitious interviews. I would ask Rilke of the void he saw in this sky while he walked along these same stones, while these same stones breathed into his verse another type of void, another type of voice. I would ask him of how lieber rhymes with Fieber. I would try to anticipate the answer. I would ask Melville of the solitude and silence he felt around these Roman walls, in March 1857. Then he felt lost; this morning he was a reminder. 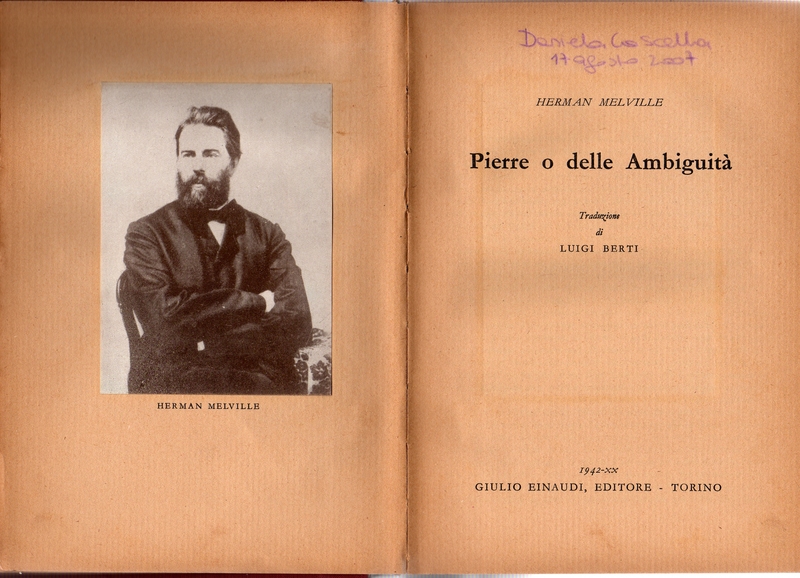 To engage in an imaginary interview with Melville was like picturing Time in front of me: the Time of words when they take time to resound or seep through the mind, the Time of thoughts as they take shape into words, the Time of actions kept forever inside words. Everything seemed gathered, concluded; it now opens up again and draws a new horizon. It all has to be part of some other yet uncovered landscape. I would ask Hawthorne of an entry in his diary, 23 October 1858. What now impresses me is the languor of Rome – its nastiness – its weary pavements – its little life pressed down by a weight of death. Did you know this weight is even heavier today? Between these unspoken interviews, loaded with memories and echoes, and filigrees of sounds recalled from reading, I did not feel any loss in the absence of my interlocutors. Maybe I just wanted to be in that silence, in the time of a recordare. To record, to recollect. I’m researching an article about the Italian ethnographer and historian of religions Ernesto de Martino, who led a series of field trips in Southern Italy in the fifties looking for the permanence of ritual and magic. In particular, he studied the lamentation techniques of mourning in the Lucania region and the ancient rituals of tarantism in Puglia where people, mostly women, simulated the moves of spiders to exorcise their ‘loss of presence’. Tags: archives, Ernesto De Martino, landscape, song, who am I?